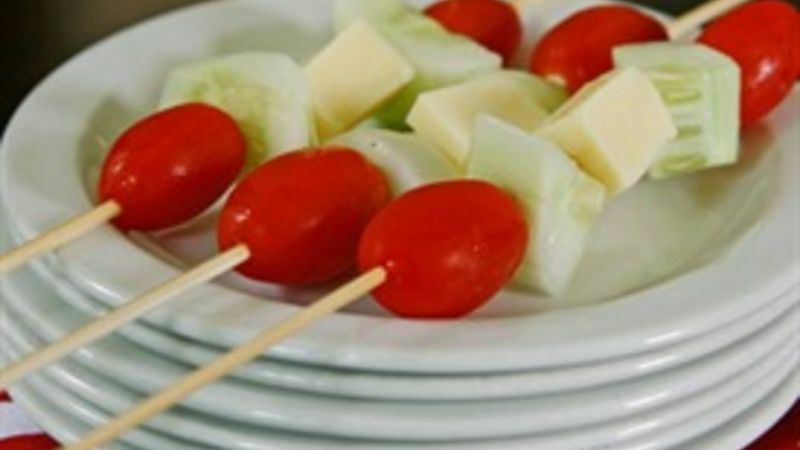 Thread one tomato onto a skewer followed by one cucumber chunk, one cheddar chunk, one cucumber chunk and one grape tomato. Repeat until all of the ingredients have been used. Want to get the kids to eat salad? Serve it the fun way -- on a stick! When we’re picnicking or having a backyard party, sometimes it’s nice to forget the utensils in favor of hand-held foods. There’s less mess, less cleanup and less to remember. But I always like to have something salad-ish with our meals. So, can you have salad sans forks? YES! This Simple Salad on a Stick is a fabulous way to enjoy the flavors of salad without the hassle of plates, forks, etc … perfect for parties or picnics or whenever. My kids particularly like when I make them for ”whenever.” Something about eating food off a stick makes the kids unspeakably happy. I can’t blame them. I have to agree on that note. Simple Salad on a Stick is as easy as can be to toss together. Or you can use the directions to make whatever combination you want – peppers, onions, other cheeses, even fruit. And to serve, a little cup of dressing is good for dipping. Or forgo it (we usually do) and just enjoy biting the bits of fresh veggies and cheese right off the stick.